Congratulations to Dong-bin Han on the tremendous achievement of winning the biggest ever tournament held in the Philippines. Han had to overcome a field of 319 to take down the title. His method may have been a little unorthodox at times, but it got the result. He came into heads up play even with David Hilton, but after ten hands it became pretty clear that he was going to win the day. He played a far more aggressive game than Hilton and even after doubling his opponent up multiple times, he never lost control of the battle. 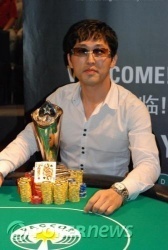 Han becomes the first Korean player to win an event on the PokerStars.net Asia Pacific Poker Tour. He'll surely pave the way for a Korean invasion on the circuit. The next stop on the tour is the Sydney Grand Final event and PokerNews will be live from the floor between December 1-6. Until then farewell. David Hilton Eliminated in 2nd Place ($101,800); Dong-bin Han Wins 2009 APPT Cebu Main Event! Just one hand after rivering a chop to stay alive in this tournament, David Hilton was all in again. He limped into the pot, then shoved over a raise to 210,000 by Dong-bin Han. Han snap-called with ; Hilton was in big trouble with . Of course, what's an all-in moment without a sweat? The flop came down , giving Hilton an open-ended straight draw. This time, however, he couldn't hit the cards he needed to stay alive. The turn and river came repeaters, and , to secure the victory for Han and eliminate Hilton in second place. 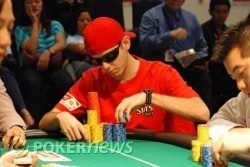 Preflop, Dong-bin Han raised to 180,000 and David Hilton moved all in. Han instantly called. The flop wasn't exactly bad to Hilton. The turn was a good card and the repeat on the river was even better, making it a split pot. Han not realising it was a split pot begun getting hugs and high fives amongst the crowd, in between fist-pumps. Someone in the crowd had to let him know it was a split pot. Back from the break, David Hilton got the first pot. He raised to 140,000 preflop and was called by Dong-bin Han. Han checked the flop to Hilton, then folded to a bet of 150,000. The players have returned to the table and the cards are back in the air. The clock has been paused, while our heads up combatants take a breather for five minutes. On a flop of Hilton led 75,000 and Dong-bin Han immediately announced, "all in," over the top. Hilton folded and Han flashed . After that double-up for David Hilton, it's back to business as usual, with Dong-bin Han winning every pot of significance. Most recently, Hilton opened for 100,000 and Han called. Both players checked a flop. On the turn , Han checked again. Hilton fired out 135,000, then called when Han raised to 335,000. That took the two players to the river . Again Han checked. Hilton took the opportunity to bet 400,000. It took Han a minute before he called with , a set of threes. Hilton showed for a busted draw that made a pair of queens on the river, not good enough to win the pot.